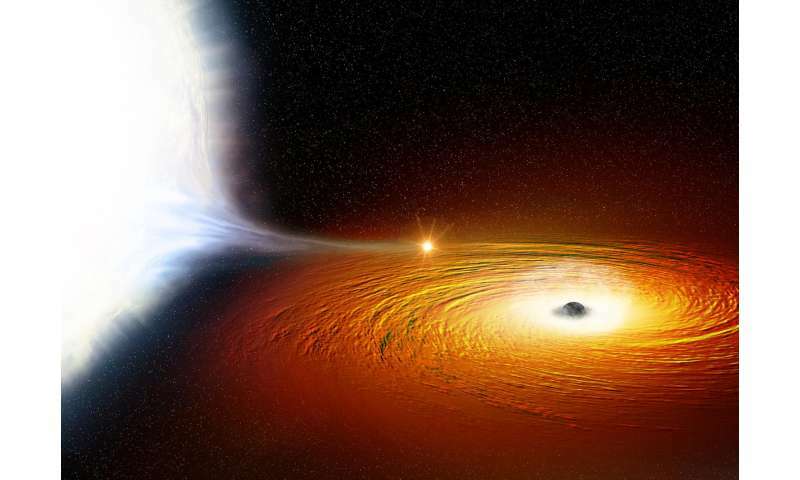 An artist's impression of a white dwarf star (left) in orbit around a black hole and so close that much of its material is being pulled away. Inset is an observation of the host globular cluster, 47 Tucanae, captured by NASA's Chandra X-ray Observatory. The system (known as X9) is indicated by the arrow, and low, medium, and high-energy X-rays are coloured red, green, and blue respectively. Credit: X-ray: NASA/CXC/University of Alberta/A.Bahramian et al. ; Illustration: NASA/CXC/M.Weiss. This discovery was made using two of NASA's space-based telescopes, the Chandra X-ray Observatory and NuSTAR, and the Australia Telescope Compact Array located in New South Wales, Australia. The stellar couple—known as a binary—is located in the globular cluster 47 Tucanae, a dense cluster of stars in our galaxy about 14,800 light years away from Earth. While astronomers have known about the binary for many years, it wasn't until 2015 that a team led by researchers from Curtin University and the International Centre for Radio Astronomy Research (ICRAR) found that it was likely made up of a black hole pulling material from a companion star. New observations from Chandra show the system—known as X9—consistently changes in X-ray brightness every 28 minutes, which is likely the length of time it takes the companion star to make one complete orbit around the black hole. Along with evidence of large amounts of oxygen in the system, this makes a strong case that X9 contains a white dwarf star orbiting a black hole at just 2.5 times the separation between the Earth and the Moon. "This white dwarf is so close to the black hole that material is being pulled away from the star and dumped onto a disk of matter around the black hole before falling in," said first author Dr Arash Bahramian, from the University of Alberta in Canada and Michigan State University in the United States. 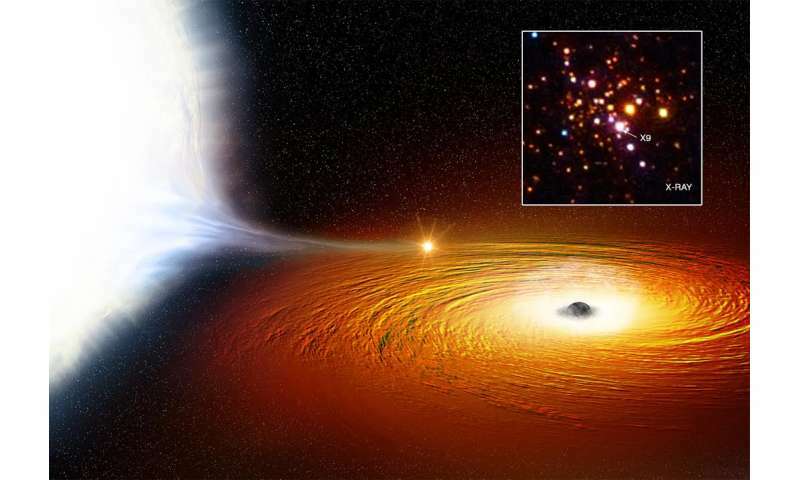 An artist's impression of a white dwarf star (left) in orbit around a black hole and so close that much of its material is being pulled away. There is a hotspot where the gas from the white dwarf hits the disc of matter swirling around the black hole. The black hole itself is surrounded by a cloud of ionised gas, which contains large amounts of oxygen. Credit: X-ray: NASA/CXC/University of Alberta/A.Bahramian et al. ; Illustration: NASA/CXC/M.Weiss. "Luckily for this star, we don't think it will follow this path into oblivion—it should stay in orbit." Although the white dwarf does not appear to be in danger of falling in or being torn apart by the black hole, its fate is uncertain. Associate Professor James Miller-Jones, from Curtin University and ICRAR, said, "We think the star may have been losing gas to the black hole for tens of millions of years and by now has now lost the majority of its mass." "Over time, we think that the star's orbit will get wider and wider as even more mass is lost, eventually turning into an exotic object similar to the famous diamond planet discovered a few years ago," he said. How did the black hole get such a close companion? One possibility is that the black hole smashed into a red giant star and as gas from the outer regions of the star were ejected a binary was formed containing a black hole and a white dwarf. The orbit of the binary would then have shrunk as gravitational waves were emitted until the black hole started pulling material from the white dwarf. The gravitational waves being produced by the binary system have a frequency too low to be detected by the ground-based facilities that confirmed the existence of gravity waves last year but it is possible that space-based gravity wave observatories in the future could be sensitive enough to detect them. Co-author Vlad Tudor, also from the Curtin University node of ICRAR, said an alternative theory would involve a neutron star that's being spun up as material is pulled away by the black hole. "Much like a spinning top as you pull the string from around its middle to make it go—but this theory doesn't explain everything we're seeing here, so our best current explanation is that we're dealing with a white dwarf in extremely close proximity to a black hole," he said. One day, we will realize that the matter a black hole contains is the FIRST thing determined in a galaxy's life. It does not continuously feed. This is why this star is there and is not going anywhere. The black hole formed first and then the star formed in the remaining disk.